Many people go out of their way to avoid being served legal documents. This is why it is important to hire a professional process server. Every state has it’s own individual set of rules regarding process serving. 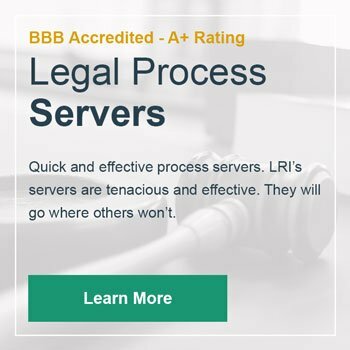 We have gathered all that you need to know about process serving in Illinois. A legal process server should be a licensed professional and someone who is authorized to serve in Illinois. These are valuable because they are both quick and effective at process serving. Process serving in Illinois could be given to the local sheriff if the town’s population is under 2 million people. The sheriff has the opportunity to give this task to someone else if need be. In a city with over 2 million people, a certified company with licensed professionals can carry out the process serving. They are supposed to fill out the back of the summons paperwork explaining how they served in a sworn statement after serving out the legal documents. Another option is to have a private person serve the legal documents who is over the age of 18. This individual can’t be a party in the dispute and is called a special process server. E-filing is now required by the state of Illinois since the beginning of 2018. This is when you file court papers online instead of in person with a clerk. This might change how the summons works. In this case, check with either the local sheriff or the circuit court to see how to proceed. There are special rules in place for these types of civil cases. Make sure that you are working with a lawyer and a licensed professional to walk you through these services. A publication can be made in the newspaper in certain situations. These situations can be but are not limited to if the defendant has left the state, is hiding from being served, or they can’t be reached by any address. The publication will include all parties names, the title of the court, the name of the parties being served, and the case number. This is required to be published one time a week for 3 weeks. A copy of this paper is also sent to the defendant’s last known address. There is a 30 day period for a response of the other party. Check with whoever has delivered your summons to see if it was properly delivered if there is no response. A second summons may be served if the first one was not successfully delivered. The second attempt is called an alias summons. This can also be called a pluries summons. If the summons is served incorrectly, this could be negative for the case of the plaintiff and their rights. Remember, no process can be made in the case until the defendant has been served the legal documents. We have over 35 years of experience process serving in Illinois. Take a look at all we have to offer in litigation support, research, domestic, and business services.